I like pizza and I like philosophy. Not just any pizza and not just any philosophy. I thought I liked Chicago Brick Oven Pizza until I tasted my wife Lee’s homeade vegan from scratch pizza and I know none other comes close. A loving sharing part of me feels she should open a restaurant and its as if the devil on the other side of my shoulder says, “No, that’s just for the two of you”. Fortunately, Lee’s run her own restaurant, and knows that if one wants to live ones golden years in happiness, at least in our case, one does not want to run a restaurant. She used to tell me the same thing (about my Cajun dishes) and at times I entertained it, and then remembered, I’d worked in the food service business many times, and it was even a rough job in my youth, I can only imagine what it would be like today. Besides both of us love being out in nature and waxing philosophical. Over the years I have observed some interesting and exciting things about Lee (other than her uncanny ability to cook, particularly bake). That part makes sense to me though she could have easily missed the gene. One of her ancestors was a famous baker in England and there is no doubt she did inherit that gene. I thought I knew how to cook; and spent many years in my youth in New Orleans kitchens, invited by famous chefs who “showed me their tricks”. Of course I didn’t learn a lot, but enough to grow up to be able to cook okay, but nothing like what Lee knows how to do. Lee is also (to me) eye candy. I never get tired of admiring her beauty. In the old days attractive women were titled “dishes”. As years went by and the womens movement grew, so were men that were deemed attractive. 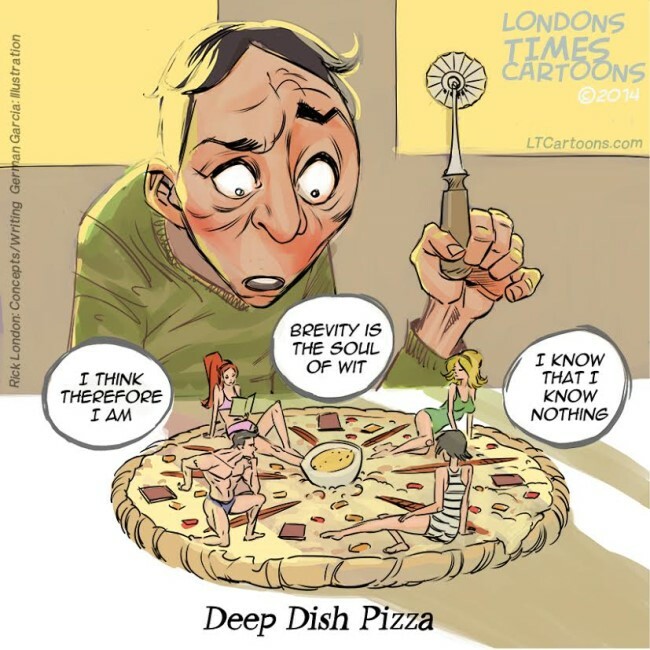 And of course pizza with thick crust is called deep-dish pizza. Hence the above cartoon. Another thing the two of us love to do is wax philosophical as I mentioned. We can either be at our living room office desks and a topic will arise that just must be discussed at that very moment. I used to not understand the urgency. Now I do. We’d forget the subject otherwise unless we wrote it down. And though for the most part we both enjoy solitude and silence while hiking in the forest, both of our ADHD kicks into overdrive when we see some type of wildlife or plant/floral growth that is unique and just waiting to be photographed. She’s been teaching me how to do that and I’ve learned to love photography. We even love those “National Geographic Moments” that happen so fast, there’s no way to capture them in the lens. One happened a few weeks ago; and it was funny as we’d not seen an owl in a long time. Lee touched one of our big favorite oaks and as if to talk to the forest, asked it to show us a great big owl. We walked another quarter of a mile and I wrote an “owl quote” about barn owls being stoked. Then we heard a loud squawk. We looked about 15 feet off to the left and there was a large blue jay squawking loudly on a tall rotten tree stump. Lee started snapping photos of it. I didn’t see the large bluejay but I saw an even larger bird, much larger on the ground. I asked her, “Are you taking a photo of that crow? I think that might be the biggest crow I’ve ever seen…no wait, it’s got to be a hawk…too big for a crow..”. I looked again and it was an owl; am guessing between 40 and 50 lbs. Watching it “take off” was astounding. It had to “fly” about 50 ft along the forest ground before gaining enough wind to truly get into the air. We were in great wonderment at the bravery of the bluejay. Bluejays are the “warning signalers” of the forest. They warn other birds and chipmunks etc of birds of prey. Usually from a distance. This bluejay was only about 10 ft. away from the large owl which could have devoured it in one gulp. Then we remembered Lee touching the tree and asking to see an owl. The forest responded. Clearly, skeptical me thought it was a fluke. Last week we were on another hike on the same trail. We remembered we’d not seen a deer in about 5 or more months, and we used to see them all the time. She asked the forest “for a deer”. Suddenly there was one of the largest deer we’d ever seen right in front of us about 30 yards down the mountain. It “modeled” for us so that we could take about 10 minutes worth of photos of it. Nature is an amazing thing. Since Emerson felt we (humans) were/are a part of nature, there is no reason it should not respond to our requests. Emerson, though a college student in New England lived at Walden Pond in a home he built across the lake from Thoreau. He loved it every bit as much as Thoreau and actually put up the money to buy it (it was not their first choice of properties). Emerson’s parents, however had other plans and he was made to return to college. But his love and fascination of nature never ended. It is a philosophy that speaks in another language, yet one we all understand. We are humbled and honored to be a part of it. Rick London is an author, songwriter, cartoonist and gift designer. He is best known for Londons Times Offbeat Cartoons which he launched in 1997 and his funny gift shop Rick London Gifts.